The concert, held in St.Mark’s Church, Salisbury, was to remember & celebrate the contribution made by our highly talented organist and accompanist, David Coram, who died in January. 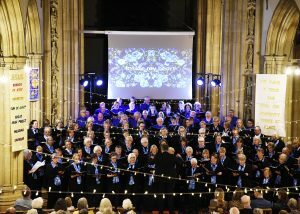 The programme was varied, planned to include the works which the choir had previously performed, and in which he had played such a key role for over 10 years. It was a very special, though emotional, evening. All proceeds including the retiring collection go to a fund set up for his children. We’ll assume you’re ok with that.